Meet Scott Roeben – one of my favorite bloggers to read daily, and his blog Vital Las Vegas. Here is what Scott says about himself (or, them, since he talks about himself in third person plural!)…. 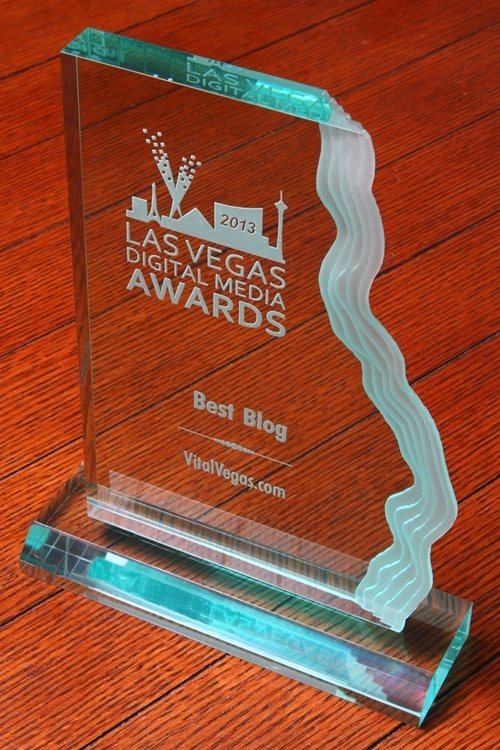 Notice the newest award he received – the Las Vegas Digital Media Award for Best Blog in 2013. Bravo, Scott! Now, he really is only one guy, but he can be as bazaar as he is interesting – funny as he is informative. What else would you want from someone giving you a personal perspective of Las Vegas? As a newbie to Las Vegas, you can pick up essential tips for your first visit. As an experienced visitor, Scott gives you an insider look at things you might not have yet experienced and should……or not. Last week, Scott posted in his blog “10 Ways to Make the Most of a Las Vegas Buffet.” This inspired me to see if any of his suggestions would apply to our four casino buffets ( five if you count Oxford Casino occasional buffet). The two largest (and most expensive) buffetts are as you would expect in CT’s mega-resorts at Mohegan Sun & Foxwoods (no more Foxwoods-MGM). Two smaller buffets include Hollywood Casino Hotel & Raceway in Bangor, Maine and a gem of a small buffet at Newport Grand Slots in Newport, Rhode Island. So, here is the Vital Vegas list, edited to meet New England’s buffets. Actually, Scott’s strategy works well for just about any buffet. 7A. This is Binbin’s (so I’ll speak in third person too, I guess) suggestion concerning plate-size. Take smaller plates – not necessarily to eat less, but to leave the table more. Getting up for a stretch and walking around again to survey the best of what you missed is a great strategy to continue the experience. After all, for the price of many of the largest buffets, you want to just spend time and relax a little more, get a little exercise and get a time value out irt as well! 10. Don’t Screw Up Dessert – “The single biggest mistake of novice buffet-goers is eating so much that they can’t enjoy dessert. While desserts aren’t the most high-cost items at a buffet, they’re some of the most pleasing, so save room.” I agree. After all, the desserts are what many of the best casino buffets are the most proud. Leave room, try small quantities of all. 1) This blog includes ten suggestions for getting the best “VALUE” from your buffet. Plainridge / Penn National Slots Winner – Will Twin River Be the Loser? You’re welcome. I read you everyday through Hunter’s app VegasMate. Oh, by the way, great suggestion for the Viator contest on Five Hundy. So funny, but so true. It could end at the Berlin Wall in Main Street Station. Aw, thanks for sharing this, and for the kind words about the blog. Love your take on the list, too!